Hunt’s bumble bee, Bombus huntii, a native to the intermountain west. Bumble bees, like their well-known honey bee cousins, are important pollinators of agricultural crops and native plants. But bumble bees are mainly used to pollinate greenhouse plants like peppers and tomatoes rather than field crops. Anecdotal evidence over the past 10-15 years has suggested that several bumble bee species are disappearing and that their range is constricting. Coupled with the current declines in honey bee populations, the decline in some bumble bee species sparked urgent action for finding suitable pollinators so that we can continue to enjoy the various fruits, vegetables, and flora that play important roles—nutritionally and aesthetically—in our daily lives. Entomologist James Strange is doing his part to help find new pollinators that can rise to the task of working in the greenhouse and the field. From his post in the Pollinating Insects Biology, Management, and Systematics Research Unit in Logan, Utah, Strange is studying various bumble bee species that could serve as the next generation of proficient commercial pollinators. Strange has traveled all over the country in search of bees. Over the past few years, one bumble bee in particular, the western bumble bee, Bombus occidentalis, has caught his eye. The range of this native species is one that Strange and other scientists believe has declined over the years. “Although most of the preliminary observations of species decline were anecdotal, recent studies in North America have documented both decreased bumble bee abundance and absence of some species where they were once fairly abundant,” says Strange. The western bumble bee, Bombus occidentalis. Just 20 years ago, B. occidentalis was one of the most common bees found in western North America. Its native range includes Alaska and the Aleutian Archipelago, south to the mountains in Arizona and New Mexico. 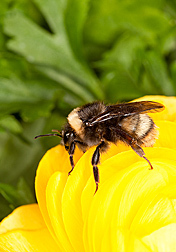 The bee could also be found from the Pacific coastline of the United States and Canada east to the plains of central Canada and central Colorado. It has also been detected in the Big Horn Mountains of Wyoming and the isolated Black Hills of South Dakota. Companies used to rear colonies of B. occidentalis for commercial greenhouse pollination. The bee is known as a generalist forager, which means it doesn’t have a narrow preference for which type of plants it pollinates, making it ideal for use on a wide variety of crops. But in the late 1990s, commercial colonies were affected by disease, causing companies to stop rearing the bees. Strange and colleague Jonathan Koch, a graduate student at Utah State University, sought to examine the extent of B. occidentalis’s disappearance. But to do that, they first had to comb through numerous historical records in museum collections to gather information about the insect’s native range and abundance so they could accurately compare it to the bee’s current range and abundance. For this task, they enlisted the help of fellow ARS entomologist Terry Griswold, curator of the U.S. National Pollinating Insects Collection. After combining their data with information collected by a team of University of Illinois scientists led by entomologist Sydney Cameron, the researchers now have a large database containing information on more than 80,000 Bombus specimens representing 10 species throughout the country, including B. occidentalis. Coupled with geographic information system (GIS) modeling technology, Strange and colleagues were able to construct historical and current range maps of several bumble bee species. Details of the mapping process are described in Proceedings of the National Academy of Sciences. Genetic testing conducted by Strange and University of Illinois colleagues also confirmed that B. occidentalis is not as genetically diverse as other bee species, and it has a higher prevalence of pathogens than that found in species with stable populations. Lee Solter, the research team’s pathologist at the University of Illinois, is currently conducting more pathogen tests on colonies of B. occidentalis that Strange is rearing in his lab. With her help, we may finally find the culprit behind the bee’s decline. 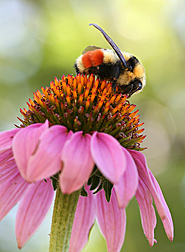 Since the collapse of commercially reared B. occidentalis in the 1990s, companies and growers have turned to Bombus impatiens, a generalist pollinator native to the midwestern and eastern United States and Canada. Companies are shipping colonies of B. impatiens from rearing facilities in the midwestern United States for use in greenhouses in the western part of the country. But scientists are becoming increasingly concerned about using a bee outside of its native range, because doing so could have drastic environmental implications. For example, if B. impatiens escapes from the greenhouse and forms wild colonies in the western United States, it could compete with native bees there for food and resources. Additionally, nonnative B. impatiens could expose native bumble bee species to pathogens to which they are not adapted. This is a serious concern, as evidenced by some western states restricting the import and use of nonnative bees. Strange has been researching a possible solution: a pretty, orange-striped bee named Bombus huntii. The insect is another generalist pollinator that could be used in greenhouse pollination. Strange is determining how to best rear B. huntii in a laboratory environment, a vital component in commercializing this bee species. With continued research, this bee may soon be making its debut in greenhouses throughout the western United States.—By Stephanie Yao, formerly with ARS. This research is part of Crop Production, an ARS national program (#305) described at http://www.ars.usda.gov/research/programs.htm. James Strange is with the USDA-ARS Pollinating Insects Biology, Management, and Systematics Laboratory, 5310 Old Main Hill, Logan, UT 84322; (435) 797-7151. 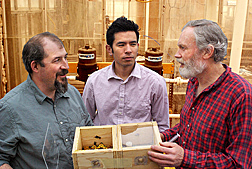 "Where the Wild Bees Are: The Search for More Pollinators" was published in the August 2011 issue of Agricultural Research magazine.